Apple has packed its all-new MacBook with some impressive technology, but its outstanding battery life —nine hours from a single charge —may be the most staggering. AppleInsider took a look under the hood to see how they could have done it. On the surface, nine hours of battery life may not seem all that spectacular. The refreshed 13-inch MacBook Pro, which also runs on Intel's power-sipping Broadwell chips, got nearly two hours more during our testing earlier this month. 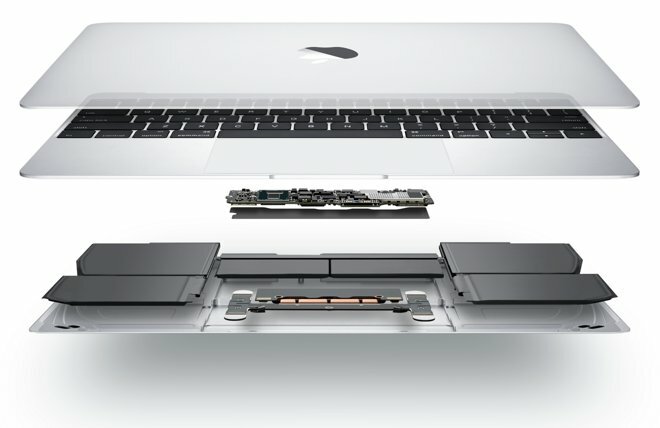 There's one catch: the MacBook Pro has a battery nearly twice the size. The MacBook's 39.7 watt-hour (Wh) power reserve is 35Wh smaller than the 74.9Wh unit on the MacBook Pro. It's even smaller than the 54Wh part stuffed into the 13-inch MacBook Air, which itself lasts for 12 hours off the plug. So how does Apple do it? The answer lies in a combination of new technologies: an updated Retina display, ultra-low-power RAM, and Intel's Broadwell processors. Though we haven't had a chance to test it yet, the 12-inch Retina display is almost certainly the new MacBook's biggest power draw. High-resolution displays are inherently power hungry; in addition to the graphics processing power required to drive millions of pixels, those pixels are very densely packed, making it more difficult for the backlight to push its way through. Generally, this mandates a larger battery to drive a more powerful backlight —we saw that in action with the third-generation iPad and second-generation iPad mini, which found themselves fattened up to support their new Retina displays. In TFT-LCD displays, some portion of each individual pixel is covered by transistors that control the behavior of the red, green, and blue subpixels. Depending on the panel type and design, the uncovered portion —or the "aperture" —can be as little as half of the pixel. As the aperture gets smaller, the backlight needs to be more powerful to reach the same level of display brightness, driving up power requirements. 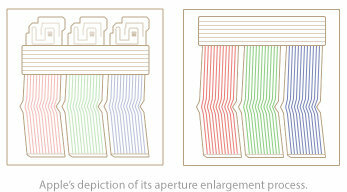 Fortunately, there are a number of ways to make the aperture larger. One method is to change the materials that the transistors are made of. LTPS-based panels, like those found on Apple's latest iPhones, boast higher electron mobility which allows the transistor to be smaller, thus increasing the pixel aperture. Another option is to redesign the pixel itself, which is an approach that Apple seems to have taken with the new MacBook. The company doesn't specify exactly what they've done, but a small animation on the MacBook landing page shows some components being layered on top of others, expanding the aperture. While we don't know which parts are being depicted, Apple has explored stacking various pixel components in the past. In a patent awarded to Apple in January, inventors Youngbae Park, Shih Chang Chang, Vasudha Gupta, and John Z. Zhong discuss splitting the gate or data lines in half, then stacking the two halves on top of each other. Regardless of the practical implementation, Apple says that their larger aperture ratio enabled them to fit a backlight that's 30 percent more efficient than the backlight in its other notebooks. This is a significant improvement on its own, and substantially eases the display's power requirements. After the display, the processor most directly affects device battery life. For the MacBook, Apple chose Intel's Broadwell Core M line of ultra-low voltage dual-core chips. 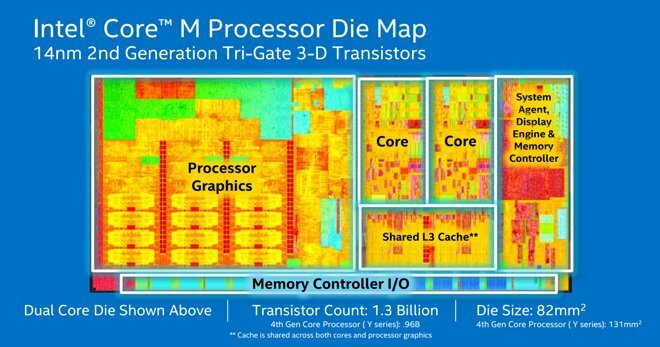 As the 'tick' in Intel's processor cycle, Broadwell brings minor architectural changes, but its primary claim to fame is a process shrink from 22 to 14 nanometers. Broadly speaking, a process shrink means making transistors smaller, which allows chipmakers to pack more transistors into the same space, increasing efficiency. Intel says Broadwell processors use around 30 percent less power than their Haswell predecessors, while keeping performance the same or better. While this is good news for MacBook Pro owners, simply using Broadwell versions of the same chips wasn't enough for the new MacBook. Instead, Apple turned to an even lower-power option, Core M.
Where the Core i5 found in the MacBook Air uses 15 watts of power when active, the MacBook's Core M draws just 5 watts. This lower draw also translates to less dissipated heat, which makes it practical for the MacBook to go fanless, eliminating another power drain. We don't know exactly which Core M chips will land in shipping MacBooks, but the evidence suggests that it will be the 5Y70 (1.1GHz base clock) and 5Y71 (1.2GHz) models. Apple probably won't receive off-the-shelf parts —the 5Y70 and 5Y71 are rated for 4.5 watts, compared to the 5 watts Apple cites —but the broad strokes are likely to be similar. As we noted in our look at the latest 13-inch MacBook Pro, ultra-low-power LPDDR3 RAM has begun to propagate throughout Apple's laptop lineup. It first appeared in the 2013 MacBook Air, and is likewise featured in the new MacBook. LPDDR3 was originally developed for use in smartphones and tablets, and as such is architecturally different from DDR3L, which is a low-power version of traditional desktop RAM that's often used in laptop computers. Aside from requiring lower I/O voltage —LPDDR3 runs on 1.2 volt HSUL, versus 1.35 volt SSTL for DDR3L —LPDDR3 also sips power while in standby. In standby mode, LPDDR3 uses just 10% of the power of desktop DDR3. LPDDR3 is designed to operate at 70 percent of the power required of traditional desktop DDR3 while active. In standby, that drops down to just 10 percent. Compare that to DDR3L's 85 percent across the board, and the power savings become obvious. Curiously, Apple doesn't provide any data on the standby time for the new MacBook, a stat that it trumpets on the MacBook Air. It's unclear why that's omitted, but it will be interesting to see how it stacks up to the 30 days of standby on the Air. While the new Retina display, Broadwell chips, and LPDDR3 RAM seem to be the most important factors in the new MacBook's impressive battery life, they aren't the only ones. The addition of 802.11ac Wi-Fi, for example, could help by completing network requests more quickly, allowing the radio to return to low-power standby mode faster. This is the same basic concept that gives mobile phones better battery life when using LTE, even though the radio itself uses more power. The MacBook's redesigned keyboard could also play a role. Rather than using a single set of LEDs with a plastic diffuser as older models do, Apple has placed an individual LED under each key in the new MacBook. This might allow for advanced energy management options, like more granular backlight intensity or varying the light level of individual keys based on their importance. And, of course, Apple's new terraced batteries —which AppleInsider will take a more in-depth look at later this week —allow the company to pack in more capacity than they would have been able to with traditional designs. We won't know the full story until the new MacBook ships, but from the outside looking in, Apple seems to have hit the power efficiency ball out of the park.